Refill your cup 1/2 day event for women to recharge and reconnect. This event is the first of its kind and is the co-creative vision of 2 very special women from the Hurunui District in Canterbury, South Island, N.Z. whom felt the urge to do something to support other women locally and from further afield attracted to this event through the many challenges of life presenting at this time. The intention is that everyone leaves feeling more relaxed, empowered and uplifted. To attend this event you must register by phone or email. Please review this information below for details. I am delighted to be invited to be the first speaker at this special women's only event. I feel it is my great honour to welcome and settled everyone into this event. I intend to share a uplifting wellness talk based on scientific mind~body understandings married with personal experiences and practical spiritual wisdom. I will share a few insightful and revealing funny stories about the tendencies of the human nature. It is my intentions that each person will leave with plenty of useful and uplifting food for mind, body and spirit. Refill your cup is a sponsored half day free event held in Amberley township for women to take time out to relax, recharge and leave feeling inspired and uplifted. It is an event to bring women together at this time in the acknowledgement of much additional stresses and challenges in life that can seem over whelming and lonely to cope with on some days. 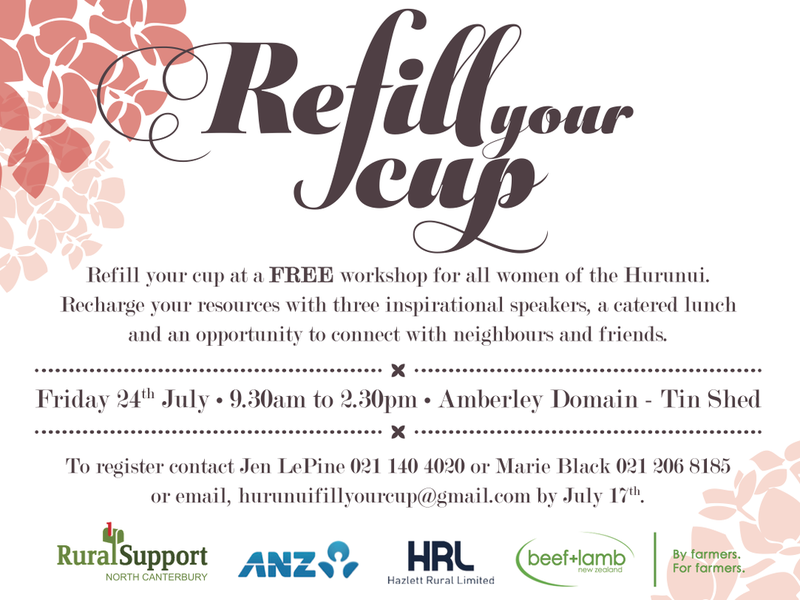 Refill your cup event is a invitation and opportunity to take a few hours out of busy life's and be held in a gentle but strong supportive space with the companionship of other women, while listening to 3 great inspirational speakers and enjoying a complimentary shared lunch. This event has been developed with the hope to offer those that attend gentle relief, while recharging ones inner battery store of resources and energy. It will be a chance to reconnect within ones self more deeply and with other like minded women in a safe and sacred space to share authentic conversations and support emotional intelligence.